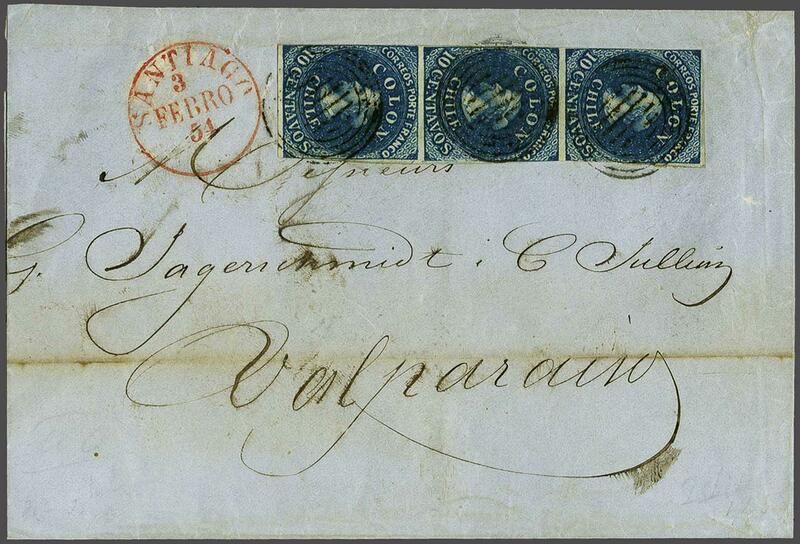 London Printing 1853 (July 1): 10 c. deep bright blue on yellowish paper, a vertical strip of three with large margins at top and at base and shaved at sides, used on 1854 cover to Valparaiso at 1½ ounce rate, cancelled by six barred target handstamps in black with SANTIAGO datestamp (Feb 3) in red alongside. The cover slightly trimmed at left and with two heavy red wax seals on reverse. An extremely scarce multiple of the first issue on letter.rnProvenance: Collection Albert Quast, Harmer Rooke, June 1963, lot 54.